I love running with others, but find group runs often cause people to abandon their training plans and transform an easy run into the 10k World Championships. Concerned about the fate of my future group running experiences, I was emboldened to cure this disease (you can thank me for my altruism later). My first goal was to diagnosis this disease. Maybe I had been wrong in assuming a group run on a Sunday morning should be easy. From the Nike Running Club website they state, “Just lace up and join us at the Niketown Running Club. Runners and walkers of all levels meet to run 3, 5, and 7 miles-your choice, your pace, it’s fun, free, and a workout.” I suspected that the Nike Corporate author had mistakenly used “workout” when “race” would have been more appropriate. From an online dictionary I discovered workout means, “any trial or practice session”. Something was amidst here, why would the website state the group run was a practice session, when clearly it was a race for the free fruit provided afterwards? Concerned that I had missed an important message from the run club, I checked my email from a popular service beginning with G and ending with mail. Unfortunately, the only emails I discovered were the opportunity to make $300/day for clicking my mouse and an email written in some Asian language. By this point, I was obviously concerned that Nike was actively seeking to sabotage my group run experiences. Familiar with the concept of online behavioral targeting, I reset my “cookies”, yet this did not have the intended effect. The Nike Running Club website continued to state it was a workout instead of a race. My options diverged at this point. I could take the well traveled path of creating a documentary exposing Nike ‘s attempts to sabotage my running club experiences (maybe Michael Moore could co-produce the “doc”) or except my fate. My cappuccino had become dangerously low at this point and aware of the time involved in creating a documentary, I decided for the latter option so that I could purchase a delicious cup of Italian coffee (for the low price of $3.22). Here are a few mistakes I have made this year and lessons you can learn from. Replenish calories you burn: Eating 3000 calories a day is a job and between work and training it can be easy to skip meals. The problem is daily caloric deficits can add up and soon you start losing muscle mass. As someone who doesn’t need to lose weight, this led me to burnout, fatigue, and tiredness. My solution is to now have snacks that require no preparation (pretzels, yogurt cups, and almonds). Dress for warmth not time: Competitive triathletes are always looking for ways to shave seconds off their time. A foolish way is to wear less clothing to save time during transition. I made this mistake after a 57 degree swim in the Pacific and paid the price with hypothermia and a “Did not finish” (DNF). The solution is to wear enough clothing to keep you warm. In my opinion it is better to add 30 seconds to your time then not finish. Have a plan (or two): Planning meals and workouts takes time and effort. Since most don’t have time to spare a good plan is to purchase workout plans tailored to your goals and nutrition plans based on your dietary needs. Having a professional design my nutrition and workouts around my needs has saved me time. There are a number of plans available online at sites such as Trainingpeaks.com that cost under $100. 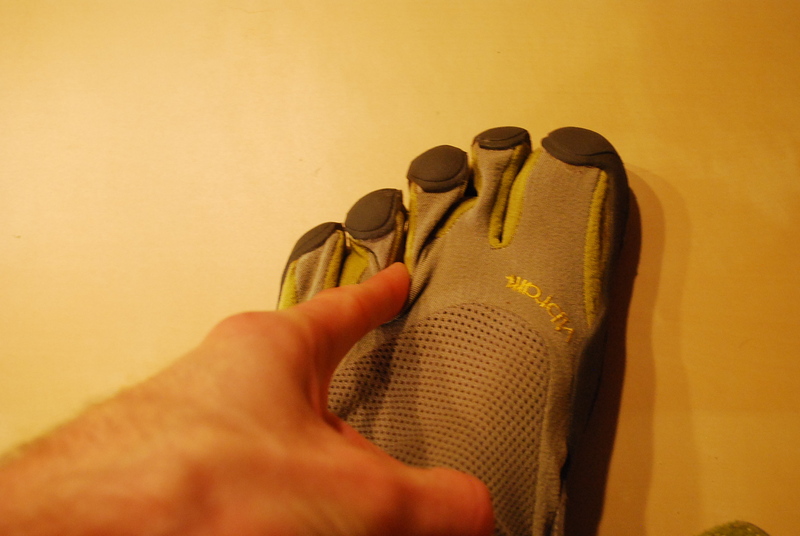 It has been over 3 months now since I took the plunge and purchased a pair of Vibram Five Fingers. Exciting! Before I dive into the details of the review, I thought I would start with a quick way to put on the shoes (quick is relative). 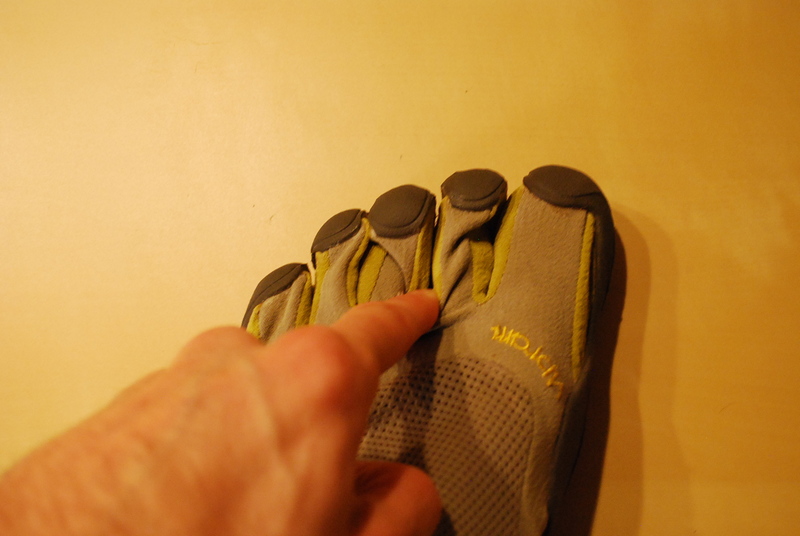 Step 2: Put your foot into the Vibrams, but leave your heel hanging out. Unlike traditional shoes, the Vibrams employ “toe boxes” which force you to slide each toe into them before fully putting the shoe on. 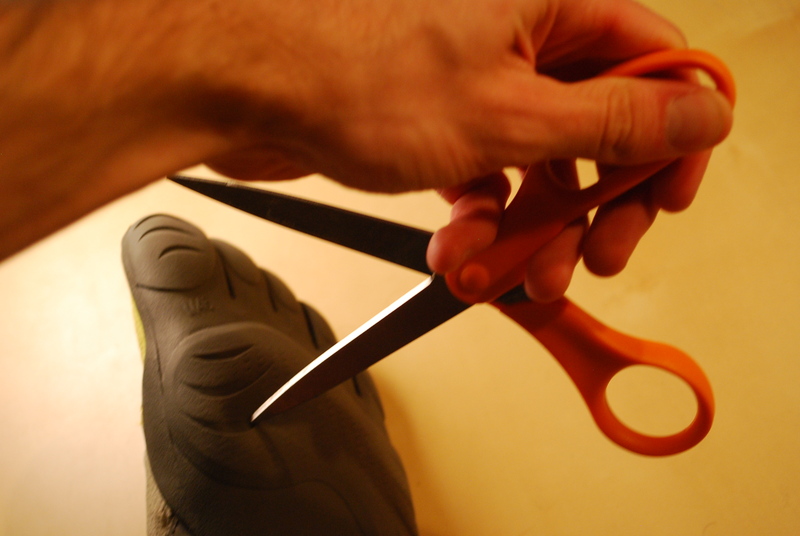 Step 3: Pull your finger between each toe to force the toe into it’s “toe box”. When your first try on your Vibrams you’ll probably have trouble getting your toes to wiggle into the shoes. Don’t get frustrated. It becomes easier overtime, but don’t try to use these in your T2 during a triathlon. Step 4: Pull up the front of the shoe to get rid of any loose fabric, then pull the back end of the shoe over your heel. Step 5: Tighten the Velcro strap until it fits snugly. 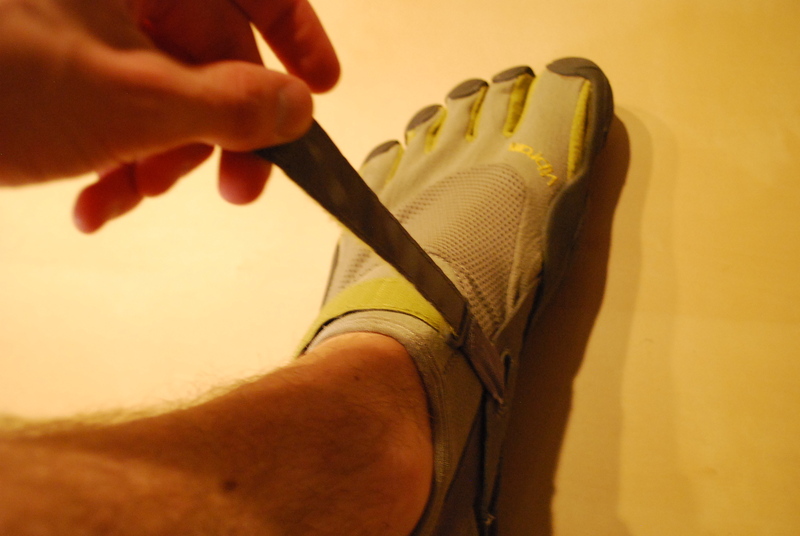 A benefit of wearing Vibrams over barefoot running is their ability to prevent sharp objects from piercing your skin. 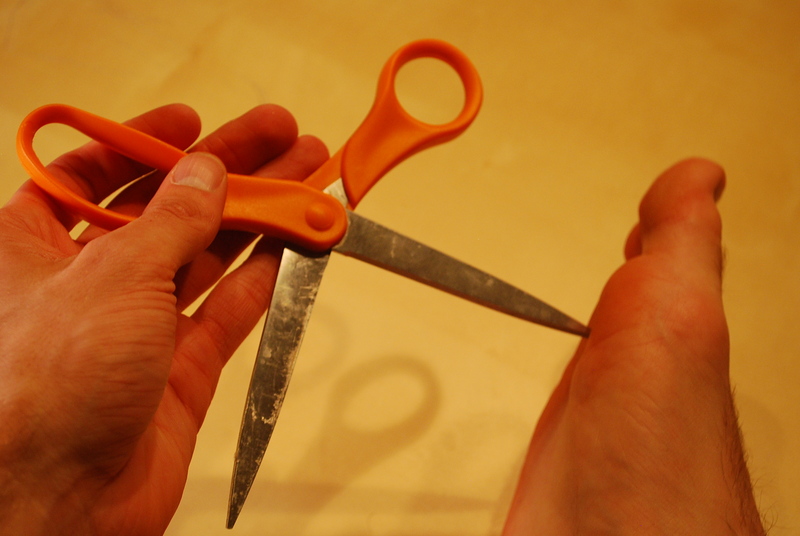 I don’t recommend trying to stick a pair of scissors in your foot! 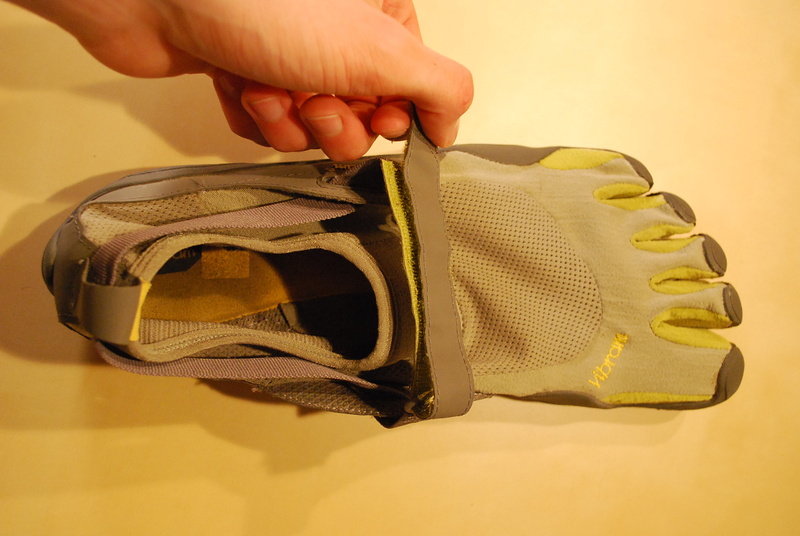 The Vibrams come in a package exactly 50% the size of Nike Frees. Not exciting, but a benefit the Environmentally-aware crowd will appreciate. The back of the Vibrams package screams, “ATTENTION! MOVING BAREFOOT IS DIFFERENT – PLEASE READ INSTRUCTIONS BEFORE USE”, but their “instructions manual” as far as I can tell is only a marketing brochure for their other models. 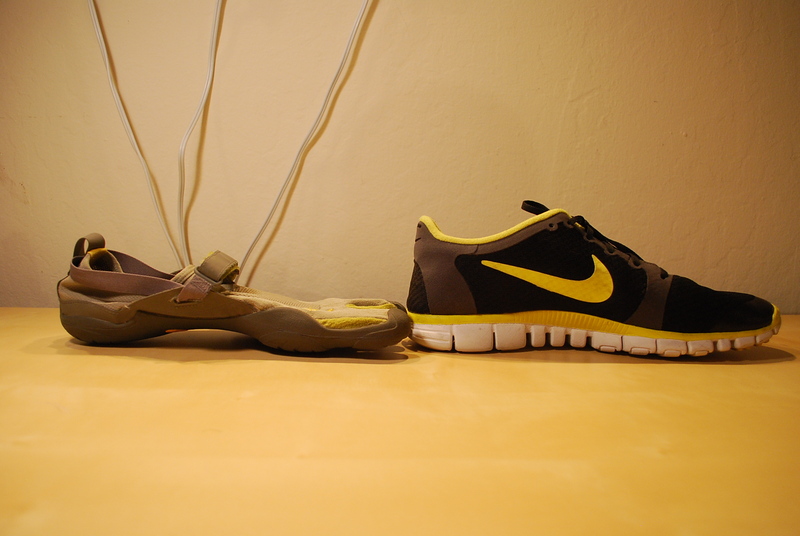 One of the biggest differences between the Vibrams and the Nike Free 3.0 is the approach they take to arch support. 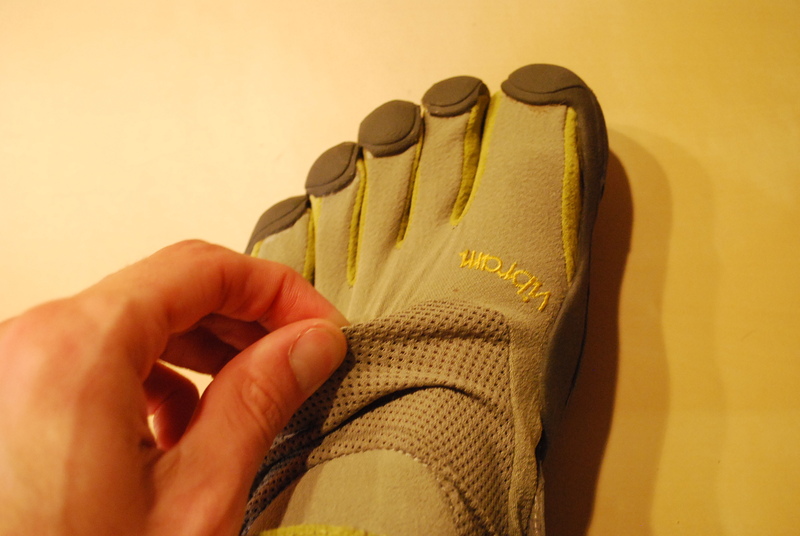 The Vibrams hug the arch, while providing a thin protective layer. This is great if you have a normal arch like myself, but may not be as comfortable for other arch types. 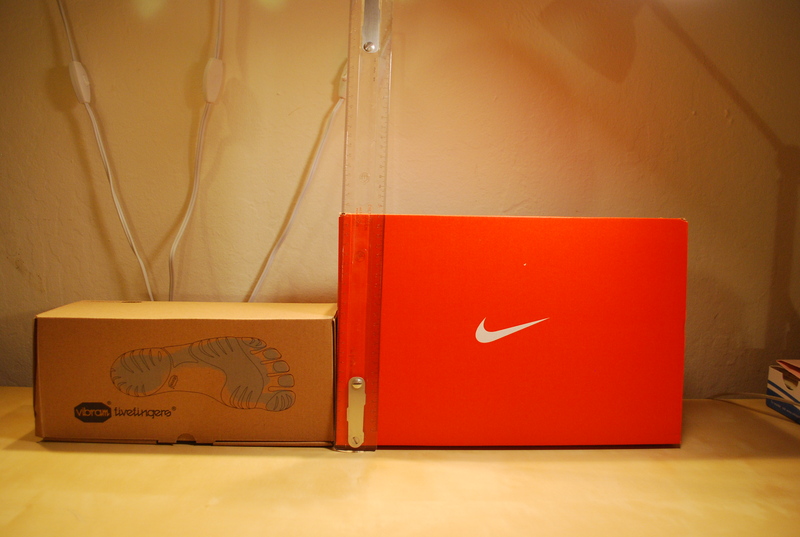 The Free builds cushioning into the arch to allow the shoe to absorb most of the impact force. If you’re searching for a close to ground feeling while protecting your feet, the Frees will likely seem too traditional for you. 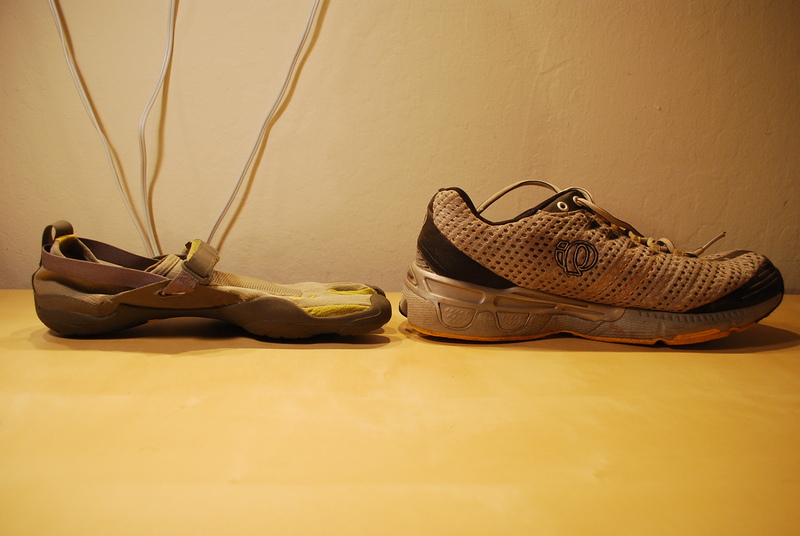 The Vibrams really stand out when you compare them to a traditional running shoe (Pearl Izumis in this case). 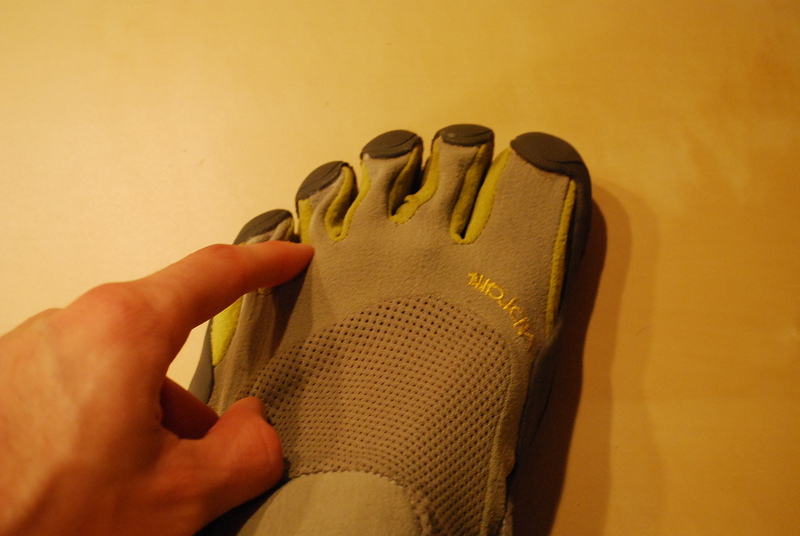 Whereas the Vibrams are <1cm in heel thickness, a traditional running shoe is 4.5cms thick. A traditional running shoe mutes the feeling of the ground whereas the Vibrams give you full feedback of the ground. I tell my friends the Vibrams are “ladies man killers”, because whenever I run by girls in them I get confused looks and expressions. If styling or public image ranks highly on your list of desirable traits the Vibrams probably aren’t for you. The shoe design isn’t inherently ugly, but what people tend to dislike the most based on asking runners and friends are the individual toe holes. I think Vibram will eventually be forced to design a shoe with a traditional toe box (like the Free 3.0) if they hope to expand beyond their current niche. I believe competitors such as Skora (Link) will likely take some of their marketshare if priced competitively when released in 2010. It has been over 3 months since I purchased the Vibrams and I have not had any durability issues yet. One area that I am potentially concerned about is the glue holding the fabric to the sole. I think this could be an area of weakness due to stresses placed on it from flexing while walking or running. The anti-microbial fabric seems to be doing it’s job, since I have not had any awkward smells coming from them. 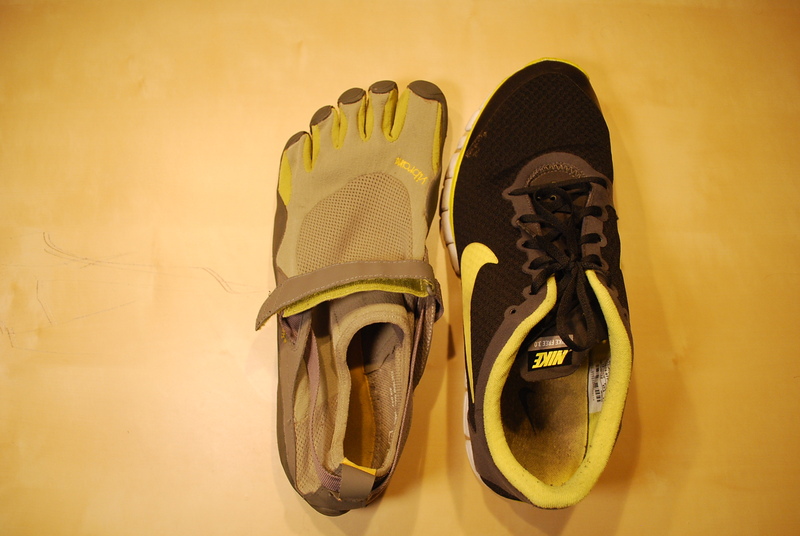 It probably isn’t a coincidence that the prices of the Vibram Five Fingers and Nike Free 3.0 are the same price in Silicon Valley. Nike who invented the Free based on feedback from Stanford University has begun to notice the Vibrams and priced the Free 3.0 competitively (prices include CA sales tax). When I first purchased the Vibrams, I had a dream that I would be able to run barefoot on a regular basis. One of the problems I have run into (no pun) living in the Bay Area, is that I have to drive in order to get to any non-paved running trails. The Vibrams work fine on dirt and grass, but I wouldn’t recommend using them on cement unless you have a well developed technique and have not had problems previously. Instead of using them for running I now use them to walk around town, going to the pool, and other daily tasks. Coming from the Free 3.0 to the Vibrams I have not had any significant discomfort, but that may differ for customers moving from a traditional running shoe to Vibrams. I had intended to use the Vibrams for running, but as the past 3 months have gone by I have used them more frequently during my daily tasks, while still getting the barefoot feeling I enjoy. 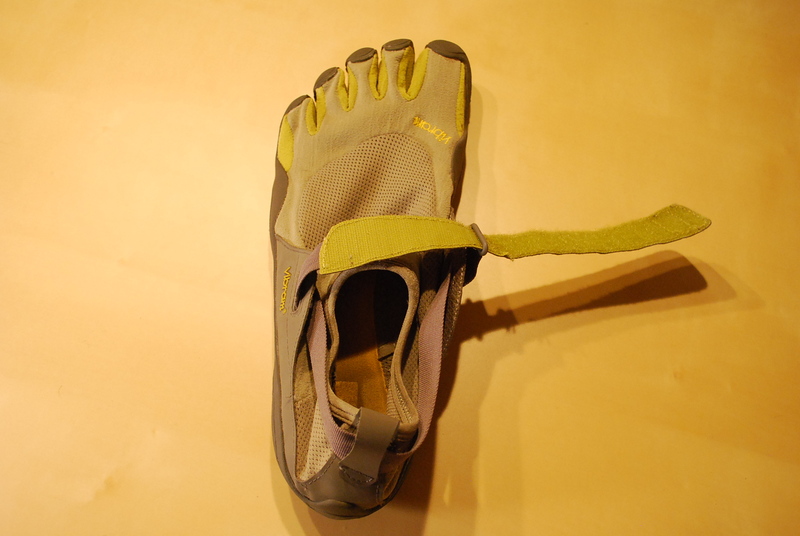 If Vibrams intention was to create a polarizing product their goal was achieved. 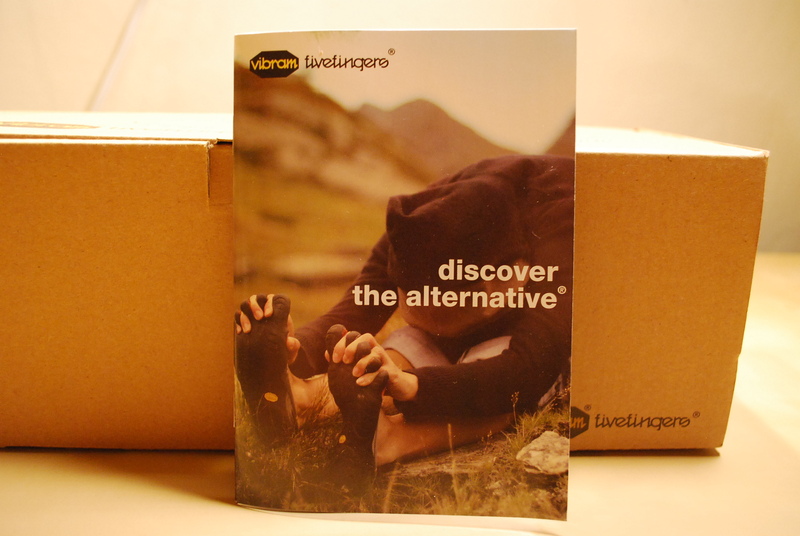 For many the individual “toe boxes” will turn them off from trying on the product, but for others they will see it as a revolutionary product offering a barefoot experience at a reasonable price. I believe with minor design changes, the Vibrams could appeal to a much wider audience, but don’t expect to see them at a triathlon anytime soon. During High School I was an ok runner. I had middle of the pack times and kept up with others on the team, but never was an all star. Our training season for cross country started in September and ended in March. We had a quick break over Christmas then trained for track and field. After our season was over we had an entire summer to finally relax and not have to train two hours after school. Sounds great doesn’t it? So what did I do during my summer break? I trained inconsistently, didn’t eat the right foods (read: Taco bell and pop tarts), and didn’t follow what any coach would consider a good training plan. It probably wouldn’t surprise anyone to learn that I never progressed beyond the middle of the pack. Consistency has been one of the single most difficult things for me to learn. When it comes to endurance sports there are no free lunches. When I decide to eat a juicy 16oz. Steak I have learned that my heart rate will be at an elevated level for the next few days while training. Nutrition: Eating not too much or too little calories, the right balance of protein, carbohydrates, and fats, and avoiding unhealthy snacks. Volume (How much distance or time you train for each sport): Completing the assigned time or distance for each sport. Intensity (What heart rate zone, wattage, or pace you are training at): Ensuring that you are not training at too high of a level too early on in the season and not going too easy later in the season at you approach your “A” level race. Disclaimer: I recognize the potential irony in this post since it is criticizing the prevalence of advice given on blogs while appearing on a blog. Let me disclaim that I am not seeking to provide advice to others or present myself as an expert. This merely represents my thoughts. Some of my goals are going to take longer then others to accomplish. Winning my age group to qualify for Alcatraz may take a decade or longer. So far I have read articles, received unsolicited advice, and have had the occasional person dissuade me. I believe all this advice can be distracting and often leads to self-doubt about my desire to reach my goals. The increase in the number of so called experts has led me to occasionally question my determination. The internet is a wonderful tool. It lets me contact a friend in Spain, track my workouts, and manage my banking online. One problem I have found is that it also has lowered the barrier to those seeking to give advice. Today we have forums, twitter, blogs, and news feeds that can inundate us on ways to change our training, a berry that will increase your VO2 max, or why we should run by ourselves. I think the problem with so many often conflicting opinions is that it makes it difficult for us to make a decision on which opinions to believe. One of the few coaches I trust to receive advice from is Joe Friel. From when I first started reading Triathlete’s Training Bible I saw that he had years of experience and had worked with novice triathletes before. His credibility gave me confidence that he understood what was going through my head and the mistakes I might be making. The problem I have with reading a blog from an individual I don’t know is that I have no idea if he knows the situation I’m going through, or if the article is even written for me. For example, if I am reading an article on running technique, how do I know if this is for a beginner, has he taught runners this technique, and is there research to support his claims? As a safety mechanism, I rely on a handful of people that have established credibility through proven experience and publications. My friends and associates are another source of advice. Overwhelmingly they are supportive of my goals. Over the past year I have met two wonderful women (you know who you are) who have been extremely supportive of my goals to qualify for Alcatraz. Occasionally I will run into an individual convinced to dissuade me. One man was an active triathlete and member of a San Francisco triathlon club. I was excited to learn that he competed in triathlons and we began talking about our goals. When he learned I had been only training for a year he told me I should forget about winning my age group and enter the lottery. Regardless of whether he had foresight into the future or 20+ years of experience (he didn’t), entering the lottery was not going to make me happy. Even if I work at this for the next decade I will be glad I put my all into it. I think this demonstrates why it is important to believe in your mission since if you do not someone will come along and advise you on something they would do that won’t necessarily make you happy. Establishing the credibility of experts and having an understanding of what makes you happy, I believe is a key to accomplishing one’s goals. It is a lesson I am carrying into other aspects of my life. Training Peaks is a great piece of hardware for tracking your workouts and meals. After finishing my first triathlon season I wanted to add structure to my nutrition and training to improve my performance. Training peaks does that and I might say quite well. Since I have only used the nutrition function so far I’ll focus my comments on this area. Training Peaks has a number of meal plans to choose from depending on your goals or caloric intake. I choose a 3000 calorie/day weight gain plan. One thing I disliked about finding a meal plan is that only a partial list of the available nutrition plans can be seen from the “Plans” heading. The only reason I found the plan was by browsing through the Coaches’ profiles. Uploading the information into the software was easy enough, although it did take a few minutes for me to find the plan once I was logged in and apply it to the calendar view. I love the dashboard view on Training Peaks. It allows me to see my net caloric intake (calories consumed – calories used). This makes it easy for me to determine whether I am headed in the right direction on my goals. One drawback is the Basal Metabolic Rate is set to 1650. If you can figure out how to change it please let me know. The first thing I do every morning is login to TP. I check my meals for the day and make sure that I have all the ingredients needed. The plans don’t explain how to make your meals so you’ll have to use your intuition to make sure you are using the ingredients correctly. For me it hasn’t been a problem, since the meals are simple enough. Today for lunch I had a “Dagwood Lunch”, a quick search of Wikipedia pulls up an image of a Dagwood sandwich with all the required ingredients. Overall I’m satisfied with Training Peaks and I would recommend it to others.